Hello everyone, Welcome back. Today is Day #2 of Taylored Expressions sneak peek of the December release. If you want to see my day #1 sneak peek projects, then click HERE. I am showcasing two Stamp and Die combo sets. The first one is called If Hearts Could Talk stamp and die combo. I love the Could Talk series of stamp sets. The all have different facial expressions to stamp making the same image look different. Simple yet cool idea. On this set, I love the wings and various sentiments as well. I made school style valentine treat bags. 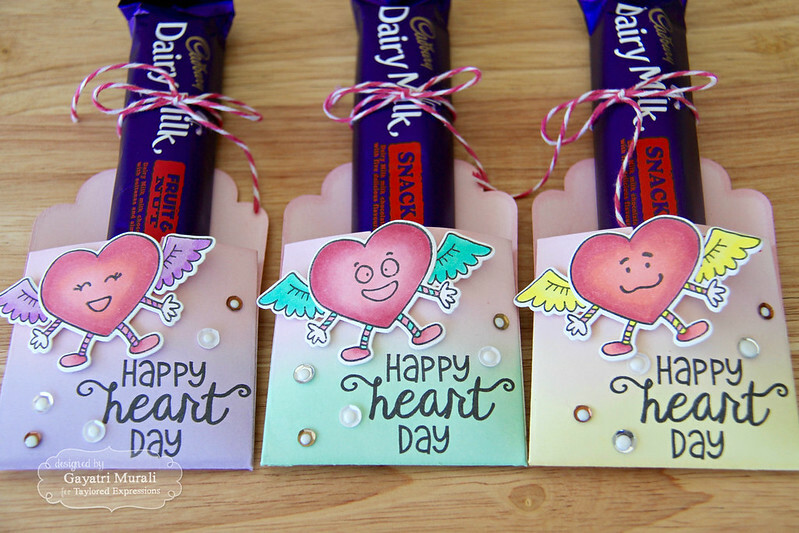 I used TE Tag Pocket die to make the treat holders. I die cut three of the tag pockets using Sugar Cube cardstock. Then sponged Pink Champagne TE dye ink on top of all three Tag Pockets including the top of the fold as well. On the bottom of the fold, I sponged Lavender Glaze, Mint Julep and Potato Chip. These inks even out and blend well once they dry. I stamped the sentiment from the stamp set using Oreo hybrid ink and mini MISTI. On a scrap piece of Sugar Cube cardstock, I stamped three heart and wings images. I coloured them with copic with the wings and socks coordinating with the colours sponged on the bottom of the tag pocket fold. Then I stamped different faces on each of the heart images, die cut them out using the coordinating dies. I adhered the wings on the back of the hearts and the entire heart on the assembled tag pocket using foam adhesives. Finally embellished with sequins and white Nuvo crystal drops on the centre. 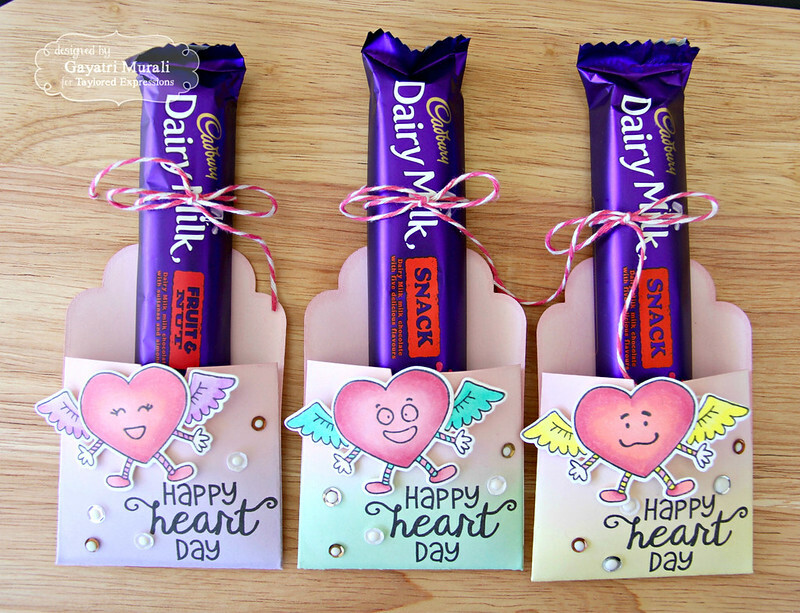 I added a bar of Cadbury chocolates on each of them and secured it using pink and white baker’s twine. The second product I am showcasing is called Lookin’ Sharp stamp and die combo. This is such a fun stamp and die combo. Particularly like the pun sentiments. I made two cards using the stamp set. 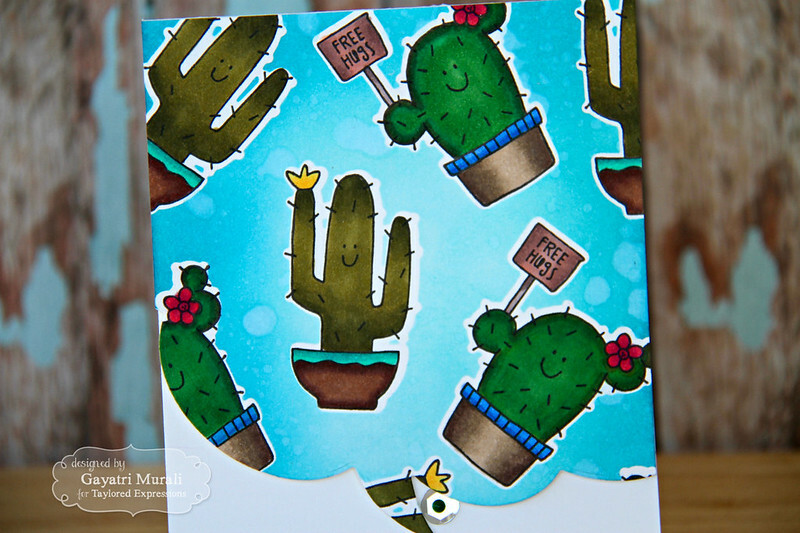 On this card, I used the same cacti stamp for both background as well as focal point. 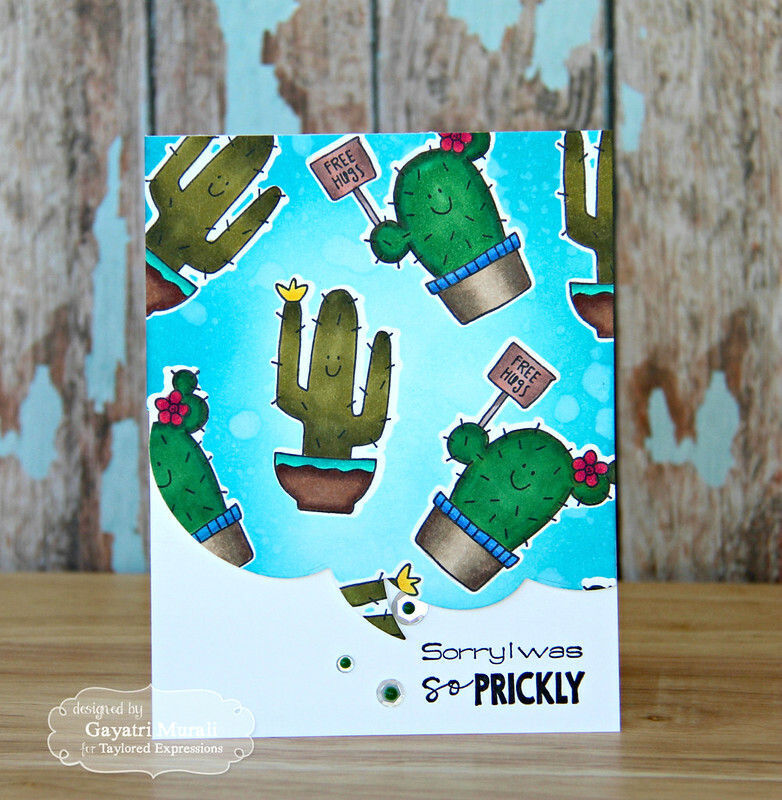 On the Sugar Cube card front I stamped the cacti image using Earl Grey dye ink. Then I die cut a smaller stitched rectangle Sugar Cube panel using Stitched Rectangle Stacklet. On the middle of the panel, I stamped a pink brush stroke image from Stroke of Genius 2 stamp set and Strawberry Milkshake ink. I stamped the same cacti image on a scrap piece of Sugar Cube cardstock, coloured using copic markers and die cut using the coordinating die. I adhered this on the centre of the stitched panel using foam adhesive. The sentiment is white heat embossed on a strip of Oreo cardstock. Finally embellished with sequins. This panel is adhered on the card front using foam adhesives. 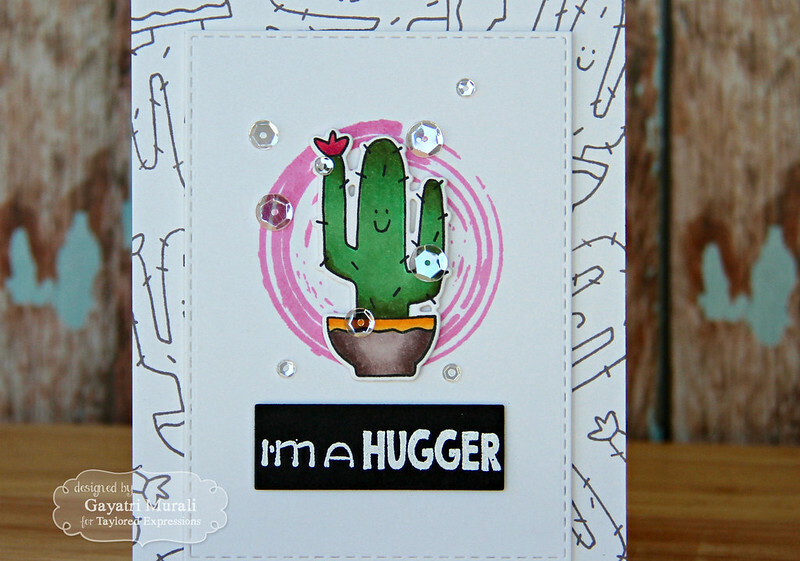 My second card feature both the cacti images from the Lookin’ Sharp stamp and die combo. On my second card I stamped both the cacti images randomly on a piece of Sugar Cube cardstock. Coloured them using copic markers. Then I masked all the coloured images using masks die cut using the coordinating dies. This gives a nice white edge to the coloured images. After masking the images, I used distress inks Tumbled Glass and Salty Ocean to sponge over. The centre of the panel has the lighter shade of blue and the edges have the darker shade of blue. I spattered clean water to the panel. This adds depth and texture to the panel. I removed all the masks and die cut the panel using Let’s Talk Edger 2 die. To assemble the card, I adhered the coloured die cut panel on Sugar Cube card base using foam adhesives. On the bottom of the card front I stamped the sentiment using Oreo hybrid ink. Finally embellishing with sequins and Nuvo crystal drops in the centre. All the supplies used to make these cards are listed below. While you are there, check out gorgeous inspirations from the rest of the designers using the sneak peek products. See you tomorrow with day #3 of the sneak peek.